We outlined the connections Bill and Melinda Gates, The Bill and Melinda Gates Foundation, and Microsoft have to profits from prisons in Part 1 here. Now we will connect these practices to the impact on our schools and offer some ways for others to join in resistance. How do these stories impact our schools? 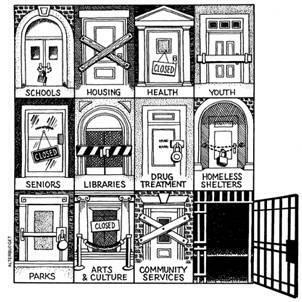 Our schools and most vulnerable are starved as we see more spent on serving our prison populations than we do on our K-12 students. Meanwhile, Microsoft’s tax evasion is creating budget shortfalls that also hurt our most vulnerable. We’ve connected the dots and you can follow the money. But don’t the people arrested deserve to be in prison? Why are we including prisoners in a group of what we call “our most vulnerable”? Aren’t they guilty of major crimes against society? He got one thing right. He definitely wears two hats. Hat Two: Profiteer from Racism and Human Suffering. It may not be possible for him to consider the inhumanity of unfettered capitalism. We need to expose this inhumanity, shifting public opinion to one that tarnishes the shiny media image he has created for himself. “The prison populations in most US states are at historic highs. Prisons in 36 US states incarcerate three times as many people as they did in 1978. State prison systems account for 87 percent of the total prisoner population, or roughly 1.3 million in 2013 compared to about 270,000 in 1978. But even as states spend more on prison operations, they are spending less on education for children and young adults, particularly in high-poverty neighborhoods. A new report from the Center on Budget and Policy Priorities (CBPP) paints a devastating picture of a polarized society in which the prison and police-military apparatus is being continually expanded while vital social programs are starved for funds. CBPP estimates that if state corrections spending had been held to mid-1980s levels, adjusted for inflation today the 50 US states would have about $28 billion more each year between them to allocate to non-prison related expenditures. According to David Sirota and Jeff Reifman, Microsoft has dodged $29.6 Billion in US taxes and $8.16 Billion in WA State taxes through intentional, possibly illegal maneuvers. “In June, the Washington State Supreme Court ordered the Legislature to appear on September 3rd to explain why it hasn’t found the revenue to fully fund the education reforms required by its McCleary ruling, reportedly as much as $7.83 billion through 2019. There are a variety of reasons the state has a huge education budget gap. After the 2008 recession, the Legislature cut $4 billion from K-12 and higher education spending, which helped absorb the costs of continuing tax breaks for corporations. While most states have an income tax to smooth revenue through downturns, voters rejected the creation of a progressive income tax in 2010. Then, last November, the Legislature awarded Boeing $8.7 billion in new tax breaks. Locally, Boeing often takes a lot of flak for its tax breaks, but Microsoft has also played a central role in lobbying for tax breaks that cripple state education spending. … Using the 50 percent figure, we can conservatively estimate Microsoft’s savings from lobbying and dodging the state royalty tax between 1997 and 2014 at $5.34 billion. If we factor in interest and the Department of Revenue’s typical 25 percent penalty on unpaid corporate taxes, that number jumps to $8.16 billion (see Scenario B). This is more than enough to fully fund public education under the Supreme Court’s McCleary decision. … These are also ethical issues. Chairman Bill Gates, former CEO Steve Ballmer and General Counsel Brad Smith are all public education advocates. In 2003, then-CEO Ballmer famously admonished taxpayers “… to come to grips with the notion that we need to invest in higher education.” Just not, it seems, corporate taxpayers. Microsoft’s tax evasions could fully fund McCleary, fully funding Washington State’s basic education budget. Budget cuts caused by the tax dodging of Microsoft would benefit our most vulnerable citizens, including the GEO prison detainees. Microsoft has used prison labor for profit while laying off Microsoft employees. 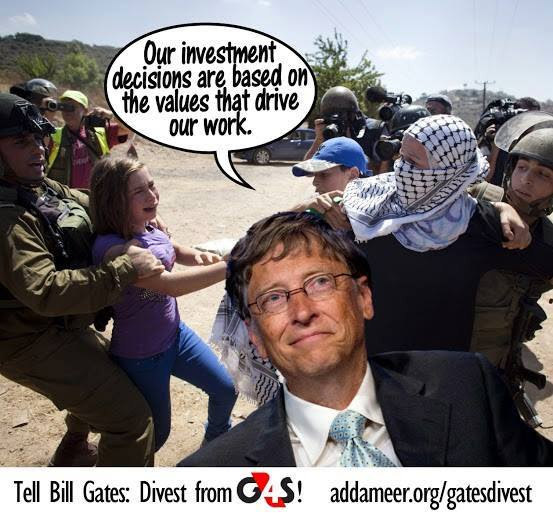 The Gates Foundation has invested in the GEO Prison Group, profiting from human misery. How does the amount of funding per inmate compared to the amount of funding per K-12 student in Washington State? Funding per inmate in Washington State: $46,897 per year. Funding per K-12 student in Washington State: $11,328 per year. Gates Microsoft tax revenues could work towards evening out the imbalance between what is spent on K-12 students vs what is spent on inmates as well. While we do not suggest treating prisoners inhumanely in any way, we do suggest that investing in education leads to an increase in incarceration. 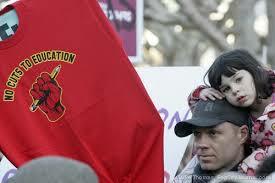 Doesn’t it make sense to invest in our children up front to prevent incarceration? The cuts to Washington State budgets create shortfalls that would otherwise fund our most vulnerable. How has America’s culture accepted this outrage? Chris Hedges explained in “The Death of the Liberal Class” how that death was caused by “visually emotive media”. Our society is inundated with prison shows, normalizing prison as an “acceptable” part of our culture. Orange is the New Black is one of the most popular programs on Netflix. IMDb lists the Top 10 Prison TV Series. MSNBC sports LOCKUP with titles like LOCKUP Raw: Violence Behind Bars. Increasingly, the public keeps their ratings high, while the media/news corporations, Hollywood, Microsoft, and Bill Gates profit from this misery. What can you do? Here are just a few ways you can help. In an effort to push the Gates from his investments in GS4 Israeli prisons, Code Pink was successful in a global protest. Follow in Code Pink’s footsteps with us. “Bill Gates has sold off some of his shares in controversial British security giant G4S after the billionaire computer software magnate was criticised for his investment. We need to increase exposure to Gates’ propaganda and demand that he divest from profiting off budget cuts through tax dodging and prison labor profits connected directly to human misery. We have to knock Gates off his humanitarian pedestal by exposing the truth vs his propaganda. 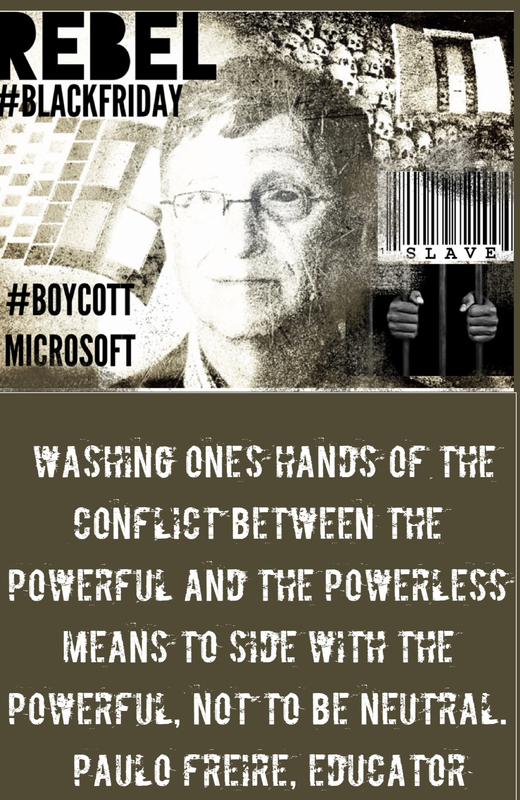 The Washington Badass Teachers Association is hosting a protest on public property near Microsoft in Redmond, WA on Black Friday, asking people WORLDWIDE to join us to #BoycottMicrosoft. This direct action is intended to increase public awareness of the Microsoft tax dodging and their ties to prison labor, education cuts, and inhumane racist labor practices. Join our protest – #BlackFriday #BoycottMicrosoft WORLDWIDE. You can make a huge impact by sharing our event and participating. Bill Gates, Microsoft, Steve Ballmer: STOP DODGING TAXES: Pay your FAIR SHARE of taxes! Donate to our #BlackFriday #BoycottMicrosoft GoFundMe to support the costs of artful resistance we have planned for our protest event. $5-20 adds up fast to crowd fund our resistance. Sign up for our Facebook event here, even if you are not attending in person at the Redmond Microsoft location. If you are in the Northwest on Black Friday, join us here for an evening candlelight vigil protest from 5:30 – 7:30 pm. Redmond, WA 98052. Follow the signs to the picket. Do you have ideas on how to move Bill and Melinda Gates toward their own idealistic humanitarian image and away from their investments in racism and human misery? Share them in the comment section below. **NOTE: We will discuss how the Microsoft tax dodging impacts other vulnerable people in future posts. This post does not begin to discuss the School-To-Prison Pipeline, which is part of the profit from human suffering and racism.